The history of Christianity in Inverkip stretches back over 830 years. In 1170, the Sheriff of Lanark gave a grant of land to the monks of Paisley Abbey; the land was described as “The penny land between the rivulets Kip and Daff." This was during the reign of William I King of Scotland, over 140 years before the battle of Bannockburn. By 1188, Inverkip Church, or the Auldkirk as it was known, had been established in the grounds of the graveyard. Records show the incumbent priest’s share of the rectorial revenues from the monks of Paisley was 100 Scots shillings per year. The Auldkirk remained in the patronage of the monks until the Reformation when the teinds and patronage, the right to present a Vicar or Minister, were passed to Lord Claude Hamilton. During the reign of Charles II they were acquired by Sir Archibald Stewart of Blackhall and stayed within the family until the 1874 Patronage Act abolished the system. 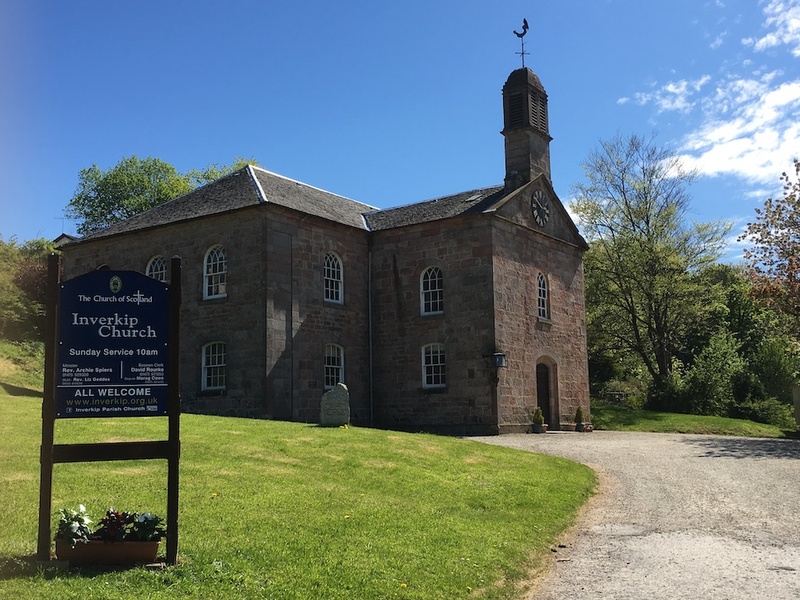 Worship at the Auldkirk altered radically during the sixteenth century with the coming of the Reformation in 1560 AD. This saw the change from Catholicism to Presbyterianism and the transfer of authority from the Pope in Rome to the General Assembly, Presbytery and Session. In Inverkip, this transfer unlike in other areas, passed peacefully. One Sunday, in 1564, Master Andrew Oliphant said mass for the last time, the following Sunday worship was conducted by a Protestant Minister. 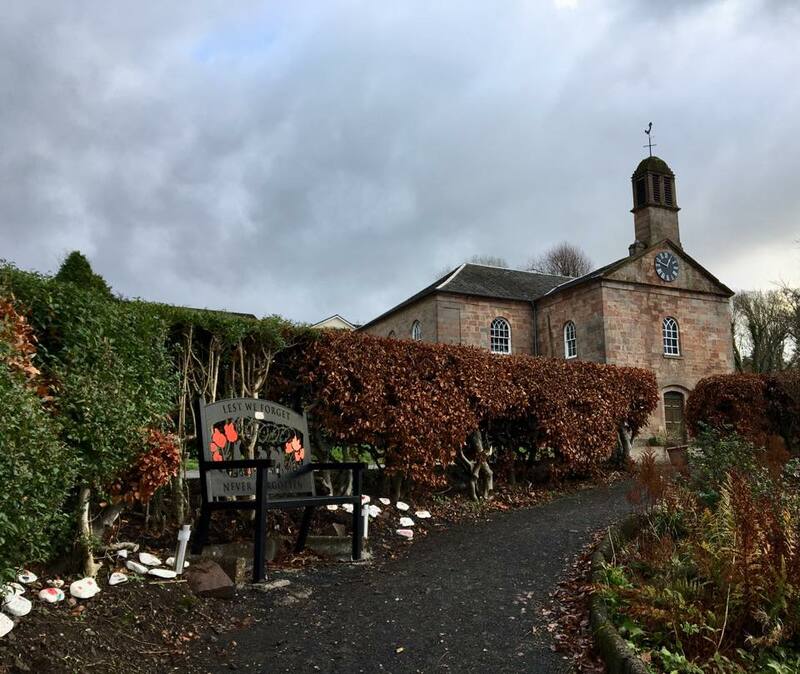 For over 400 year the Auldkirk was the only place of worship between Kilmacolm and Largs. In 1589 the inhabitants of Greenock presented a petition to the crown for a Church of their own. 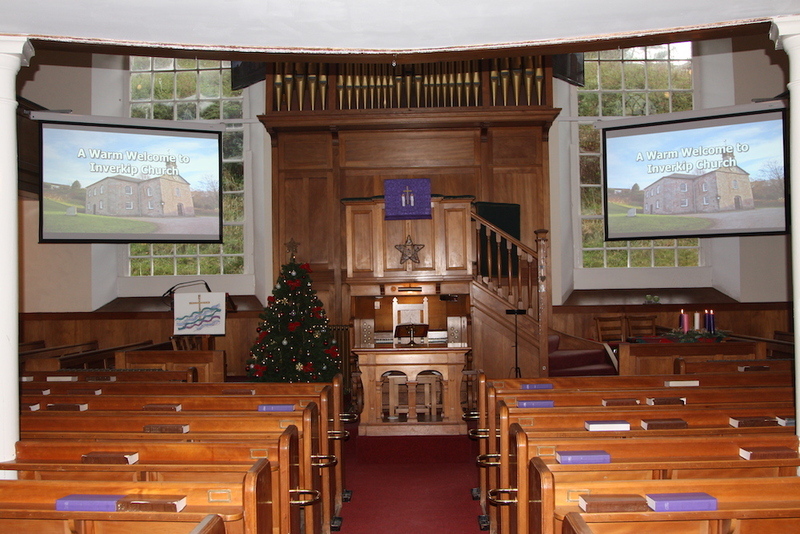 A year or two after the Royal Charter was given the Old West Church was built in Greenock. From 1640 to 1690 witch mania was rife in Inverkip. The Ministers of the parish at the time, the Rev John Hamilton (1626 to 1664) and Rev Alexander Leslie (1665 to 1684) were noted as being “zealous persecutors of witches." It is hard to imagine such a small area could be the centre of this cult for 50 years. In fact, the perceived problem was so bad, that in 1662 an application was made by Sir Archibald Stewart of Blackhall, Laird of Ardgowan to the Privy Council for a Royal Commission to enquire into the matter. It was during this enquiry that 18 year old Marie Lamont was tried as a witch before the Commission, Sir Archibald and the Rev John Hamilton. Marie confessed that “Jean King, Kattie Scott, Janet Holm, herself and sundry others, met together in the mirk, at the bucht-gait of Ardgowan whar, the devil was with them in the shape of a black man with cloven feet, and directit them to fetch whyte sand fre the shore, and cast it about yetts of Ardgowan and about the ministers hous." Marie was found guilty of witchcraft and burned at the stake, the fate of the others is not known. By the end of the eighteenth century the Auldkirk, which stood for over 600 years, had fallen into a state of disrepair, the walls were crumbling and the roof was leaking. All that remains of the Auldkirk are some stones which were used in the building of the Shaw-Stewart crypt. In 1804 Sir John Shaw-Stewart of Ardgowan commissioned the building of the present church. Popular belief is that the church was designed by Thomas Telford who had been commissioned by the Parliament to build 32 Parliamentary Churches. It is more likely that Sir John used the services of William Cairncross, Robert Adam’s assistant, as Cairncross had just completed the building of Ardgowan House. The new kirk was completed in 1806 when the Rev Thomas Brown was Minister of the parish. The church was built using local sandstone quarried from Langhouse Quarry. It is of a design typical of the period, a truncated cross with galleries to the east and west. The north is the Lairds Loft with seating for the Shaw-Stewart family, this loft is still used by the family today. Below the Lairds Loft next to the north door is the beggar’s pew, this pew was for those who could not afford to pay the dues for their own pew in church. The front pews on the west gallery still bear the name Langhouse, these pews were reserved and paid for by the Macfie family, a prominent sugar family, who lived at Langhouse. An article of 1846 states that the population of Inverkip was 584 and the Minister’s stipend is 278 14 shillings and sixpence, with a Manse and a glebe of four acres; patron, Sir Michael Robert Shaw Stewart. Unfortunately most of the parish records were lost during a fire in 1850 when in the possession of the village school master who was also Session Clerk. Although the church is light and airy there are fewer windows than appear at first glance. In total 6 false windows have been formed in the outside stone work and painted in, the false window on the upper east side has been painted to appear open! These false windows may have been incorporated to keep the symmetry of the building without incurring the tax on glass which was in force until 1851. In 1908 Sir Hugh Shaw-Stewart paid for the church to be refurbished. The pews and other woodwork were replaced with ones made from Kauri pine and were part of the last shipment of Kauri to leave New Zealand. Local craftsmen were employed to install the pews and facings which were bees-waxed and hand polished after fitting. It was during this refurbishment that the organ was installed courtesy of the Women’s Guild. Little has changed inside or out since the refurbishment of 1908. Because of this the church is currently classified by Historic Scotland as a Grade B Listed Building. Since the Reformation in 1560, nineteen Ministers have conducted worship within its walls, from the Rev George Thomson to the current day. A detailed list of Ministers can be seen on the wall in the vestry. Traditional -style worship is conducted each Sunday at 10am, with special services at Christmas, Easter and for Remembrance Sunday. Communion is celebrated three times a year where Communion cups dating back to 1777 from the Auldkirk are still used.